The next-gen Tiago is likely to borrow a few design elements from the upcoming Altroz premium hatch. 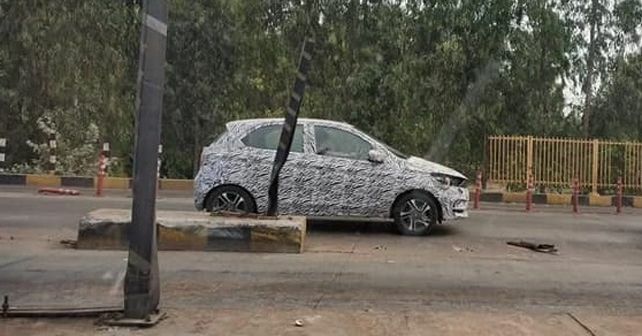 It seems that Tata is working on a face-lift version of its Tiago hatchback, as suggested by this spy image of a test mule recently caught testing. While the image does not offer a close-up look of the new version, a few significant design changes can still be spotted despite the complete camouflage cover. The first and perhaps the only thing which catches immediate attention is the face of the car, which features sleeker headlamps, much like those on the recently-unveiled Tata Altroz. Further, the front bumper seems to have undergone a sporty treatment, with more elaborate creases and contours, which could hint at a new foglamp housing. The test mule is also riding on the same five-spoke dual-tone alloy wheels offered on the XZ+ variant of the Tiago, however, that could just be to throw off onlookers. Overall, Tata does not seem to have tinkered around much with the silhouette of the car, as the test mule also carries the current car's non-fussy, practical design approach. However, keeping in mind that the Tiago has been here for around three years and the fact that its rivals are moving leaps and bounds ahead in terms of design, Tata will most likely add new-age design elements to keep the Tiago looking fresh and up-to-date. The move could also hint at the fact that Tata might bring the Tiago's design under its famed IMPACT 2.0 Design philosophy. But at this point, this is all mere speculation as we are yet to receive official word from the company. While we have a half-lit road ahead of us in terms of the Tiago's design update, what our sources do tell us with a fair bit of certainty is that the next-generation versions of the Tiago and the Tigor are likely to ditch diesel powertrain options with the introduction of BS-VI emission norms from April 2020. A straightforward explanation for this move could be that the current demand for diesel variants does not justify a hefty investment to convert the diesel engines from BS-IV to BS-VI. While it's too soon to take a call on this decision, we won't be surprised to see this trend catching up in the near future.